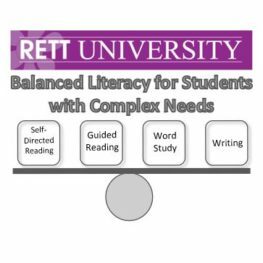 Watch this recorded webinar for an introduction to the concept of the Balanced Literacy model also known as the Four Block Model as conceptualize by Jim and Patricia Cunningham. This model is easily adapted for students with Rett Syndrome and other complex disabilities. The content is appropriate for both parents and school professionals. A knowledge of reading instruction is not necessary as this webinar will support beginners and seasoned reading instructors who want to learn how to adapt what they know about reading for students who are nonverbal with severe motor limitations. The Balanced Literacy Model and each of the 4 blocks will be defined, explained and modeled through video examples with young students and adults. Resources will include presentation handouts, an example of a Guided Reading Book built in Communicator 5, link to Making Words book and suggested apps.